Professional Teacher Trainer who teaches Kundalini Yoga in both the United States and Asia. He lives in Salt Lake City and teaches regular classes in the Salt Lake area. With a good background in posture as well as meditation, Khushbir takes yoga to the next level. Sadhana means daily spiritual practice. We begin our sadhana by reciting Japji Sahib which is a sacred text and Universal Song of God composed by Guru Nanak, the first Sikh Guru. In chanting this, we begin to understand ourselves, the world and universe around us and how we play a part in the vastness of it all. There are 38 pauris in Japji and each pauri has a different meaning and focus. For a complete listing of the chants, their meanings and affects, click here. After Japji, we begin our Kundalini Yoga Kriya followed by a relaxation. We then do a series of meditation chants called Aquarian Sadhana. 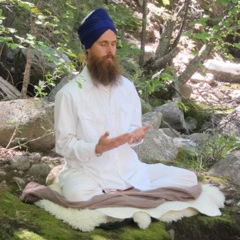 Yogi Bhajan gave many Sadhanas. The Aquarian Sadhana was specifically given to us to help us transition from the Picean age into the Aquarian Age. The Aquarian Sadhana consists of 7 different chants done in a particular order lasting in all 62 minutes. Most of the chants are very simple and can be learned right away. For a brief description and listing of the mantras, click here. Sometimes we do other chanting for the 62 minutes at times. It’s very powerful to chant together as a group. Your body is the temple of God, and your soul is the Divine Guru within. So, you get up in the morning, meditate, chant the mantras, do the exercises, call on your spirit, regulate the breath, and you get together in group consciousness. In that way you help each other. Group consciousness in morning sadhana is to help each other. If one has walked into sadhana with heart and soul in a prayerful mind, we will all benefit. That is the power of the group sadhana. You can come in at at point during the early morning sadhana. Door will be left unlocked, just come in quietly. If your to tired to participate in the chanting portion. You can sleep in the cocoon of the energy & vibration of the group during the 62 minutes of chanting. You can leave early if you need to. It’s very laid back. If your a teacher and would like to teach the Kriya or the chants, please get in touch with Amanjot Singh. They are really nice & have the benefits of each Stanza of Japji. 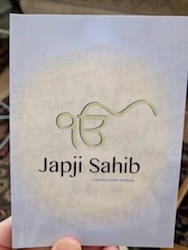 Also has the Gurmukhi, transliteration & english translation in a easy to ready format. Donations accepted to help with utilities bill/rent, helps keep the doors open.